Thursday, 12th October, 1592. Eighteen days after the action closes in An Air of Treason, courtier Sir Robert Carey and Carey's surly, larcenous, and loyal henchman Henry Dodd, Land Sergeant of Gilsland, are back in Carlisle and the Debateable Lands, the Border country, the Wild North, the land of the hot trod where the thieving, feuding reiver clans are "English when it suited, and Scots at their pleasure." 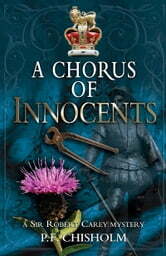 A Chorus of Innocents ushers forward Lady Elizabeth Widdrington, the married woman whom Carey adores but respects. It opens when a very pregnant young woman rides to Lady Widdrington's tower crying that her minister husband has been murdered and she herself has been raped. 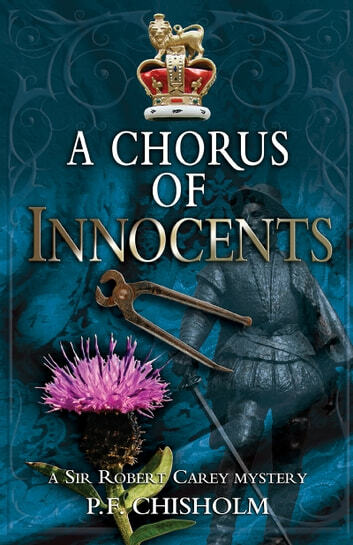 You will meet canny King James VI, his amoral favorite Lord Spynie, the fey Lady Hume, Mr. Anricks, a surprisingly skilled tooth drawer, Young Henry Widdrington with his unfortunate spots, and all the boys in murdered Minister Burn's choir. The action proceeds full tilt for ten days and "finishes with a marvelous set piece of derring-do involving enough arms and ammunition for the siege of Stalingrad, plus the last line will leave you with your heart in your mouth," says author Dana Stabenow, who adds, "As always the scene Chisholm sets is a veritable time travel portal you step through the instant you turn to the first page."